This entry was posted on Thursday, April 6th, 2017 at 11:27 pm and is filed under Drama. You can follow any responses to this entry through the RSS 2.0 feed. You can leave a response, or trackback from your own site. What a truly poignant film. 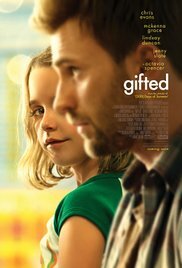 I was delighted by Mckenna Grace’s performance; she’s adorable. The character of Frank was brilliantly played by Chris Evans and it was such a nice change to see him in that role as compared to his Captain America. The humour that punctuated the dialogue was just perfect. The “I’m blending in” retort by Frank to Mary was priceless. Caution to those prone to emotions (i.e. tearing up), you will have some difficulty keeping them in check. The writing was spot on, nothing overdone, and Marc Webb has good reasons to be very proud of this movie. Thanks for review David; you know I turn to it when the IMDb storyline just doesn’t suffice.